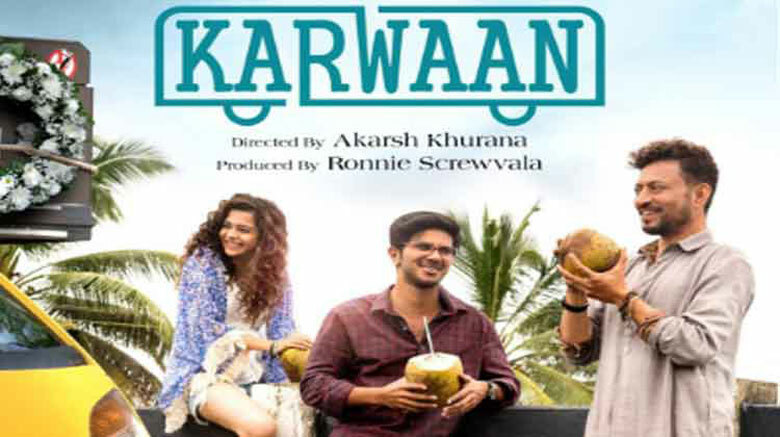 Karwaan is a comedy movie or rather a sarcastic take on a road trip was undertaken to exchange dead bodies, yes, you read it right, dead bodies! Avinash (Dulquer Salmaan) is a bored IT worker, pushed into an IT job he hates by his strict, middle-class father, who is against Avinash’s dream of becoming a photographer. So Avinash goes through his job as a routine he hates; under performing, sleeping at his desk and of course, being shouted at by his ill-tempered boss. That is until the day he reaches home and receives a rather dry and pathetic call from a travel agency, informing him that his father has died in a road accident on the way to Gangotri and they are sending him his father’s body, on “company’s expense” and he ought to go to the cargo company office tomorrow to collect it! Avinash ropes in his friend Shaukat (Irfan Khan) and his van, to bring his father’s dead body from the airport to the crematorium. At the crematorium Shaukat discovers that the dead body they got is not of a man, rather of a lady who too had died in the same accident. Avinash soon learns that his father’s body has been sent to the daughter of the woman, whose body he has received and that he must take the woman’s body to her daughter in Kochi! Along the way they take a detour to Ooty to pick up the granddaughter of the deceased lady, Tanya (Mithila Palkar) who was so drunk when she got the call from her mother, informing her of her grandmother’s demise (she loves her grandmother a lot and is very close to her) that she forgot all about it and has no clue what Avinash is talking about, when they initially meet! What follows is their journey to Kochi, full of adventure, discovery and a lot of comedy, mostly thanks to Irfan Khan. Thankfully though, the director didn’t try and turn the story into a love angle, though there is a flame and an ex in the plot, though their role is limited. The movie works, not only because it is hilarious, but also due to the fact that it is based on the relationships these days, wherein people are drifting away from their families and there is an emotional and communicational disconnect. And this movie shows that in a matter of factly way; choosing neither to sugarcoat it nor exaggerate it a lot (though some exaggeration is there). The acting of Dulquer Salmaan is good, but it is marred by a lack of compelling script and dialogues, while the chirpy Mithila works just fine with what was given to her, which isn’t a whole lot. Irfan Khan is the one, who well and truly shines, be it through his acting, situational comedy or the dialogues he is given. Overall, I really enjoyed the movie. It isn’t something that would really surprise you, but it is something that would leave you laughing and thinking, at the same time. Ps. It is an Amazon Prime Exclusive, so it will likely come to Prime Videos soon.